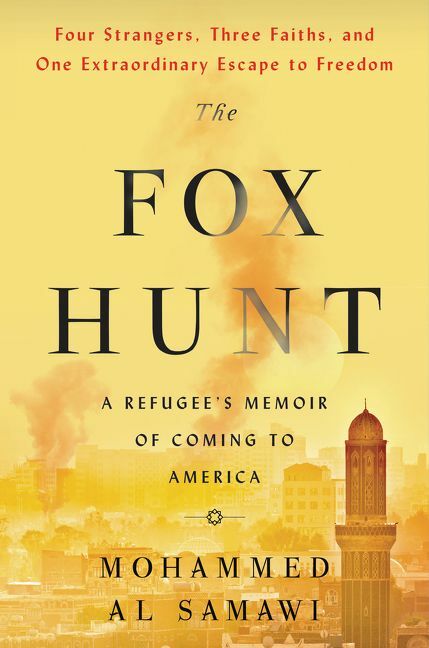 The Fox Hunt is an extraordinary story of strangers becoming brothers and sisters, of people of differing religious faiths recognizing their common humanity and going to great lengths to save a life. It’s a gripping read of one man’s life, in danger from war in general and targeted by militants in particular, spurring others to commit themselves to saving it. It’s the story of how we’re all connected, as humans yes, but also, in these days of social media, by the internet. Mohammed Al Samawi grew up in Sana’a, Yemen, the son of two doctors, in a devout Zaidi Shia family. He suffered an infantile stroke that left him with a damaged right hand and foot, so that he couldn’t run or climb things. His childhood included a lot of bullying and taunting, and he determined to succeed where he could, in school, where he was soon earning top marks. He was raised in a deeply conservative, closed society, where he was taught to fear and hate Jews and Christians. As he grows up, he decides that learning English will help him get a job. A British teacher befriends him, and Mohammed visits a foreigner’s house for the first time with great trepidation. As the two discuss religion, Mohammed gives the man a Qu’ran and is startled and somewhat alarmed to be given a Bible in return. When he reads it, he realizes that a lot of what he was taught about other religions was wrong. This sparks his desire to befriend Jews and Christians, and changes the course of his life. Mohammed gets a job with a Christian non-governmental organization and begins to attend interfaith conferences in places like Turkey and Jordan. At first, he can’t help feeling suspicious–after all, he’s been taught to hate and fear Jews all his life, and has spent time watching atrocities against Palestinian children played on a loop, over and over. But he is welcomed and accepted, and soon dedicates much of his time to promoting peace between people of different faiths. Ironically, he must do this in secret over the internet. His few attempts to do this in his own country of Yemen are met with deep suspicion and death threats. He must even hide this from his own family, because of the shame and danger he would bring upon them. When the violent threats against him begin to escalate, he leaves his family and flees south, to Aden, thinking he’ll be safer. He’s wrong. This coincided with the start of Yemen’s ongoing, tragic civil war, and Aden is soon on fire. Saudi-backed forces, along with Al Quada, are actively seeking out all Shias in the city, accusing them of siding with the Iranian-backed Houthis in the north. The book opens with Mohammed hiding out in his apartment, sleeping in a bathtub to avoid windows and outer walls, surviving on a few sips of water and stale cookies, and frantically texting people that he’d met at conferences around the world, seeing if they could help. What follows is a fantastic tale. He sent out word to everyone he could think of on Facebook and WhatsApp, and a group of strangers coalesced around him and begin pulling every string possible, following up on the most slender of connections, in order to help. It was on the level of “I once met a guy from Djibouti; let me find his card.” It took enormous sacrifices of time and comfort levels from the four in the West, but they recognized that if they failed, Mohammed would most likely die. He was surrounded by war, in a city where the airport and ports were closed, and yet, somehow, they succeeded, an unlikely tale of heroism and the many guises it can wear. The Fox Hunt is a gripping, moving tale. It details Yemen’s civil war through one man’s eyes, it showcases humanity at its best and worst, and it shows what can be possible when a disparate group of activists come together and refuse to take no for an answer. Highly recommended. True stories like this are so inspiring to me – they restore my faith in humanity.